The JP Hunter Dee w/ Dr. Bristol has attractive Dee rings and comfortable curved bars. The Dr. Bristol link applies tongue pressure when required by rider. JP Hunter Dee w/ Dr. Bristol is rated 4.8 out of 5 by 19. Rated 5 out of 5 by Doelibe from Nice bit - big rings I tried this in place of my slow twist. My horse loves this bit! Make sure you put it on correctly! The curved mouth piece helps. Rated 5 out of 5 by Grace from Great bit for the price! I like to use this bit from time to time when my horse needs something a little stronger than his regular loose ring lozenge. It is true to size and well made. I do wish that SmartPak carried other cheek piece options for the Dr. Bristol because dee rings are not my first choice. Rated 5 out of 5 by KTjoy from Great Bit! Love this bit and so does my horse ! I tried a friends and love it so had to order my own! Rated 5 out of 5 by PRyan13 from Lovely Bit! I bought this for my new mare. She has a gentle mouth but still needs to be reminded that I'm in control. 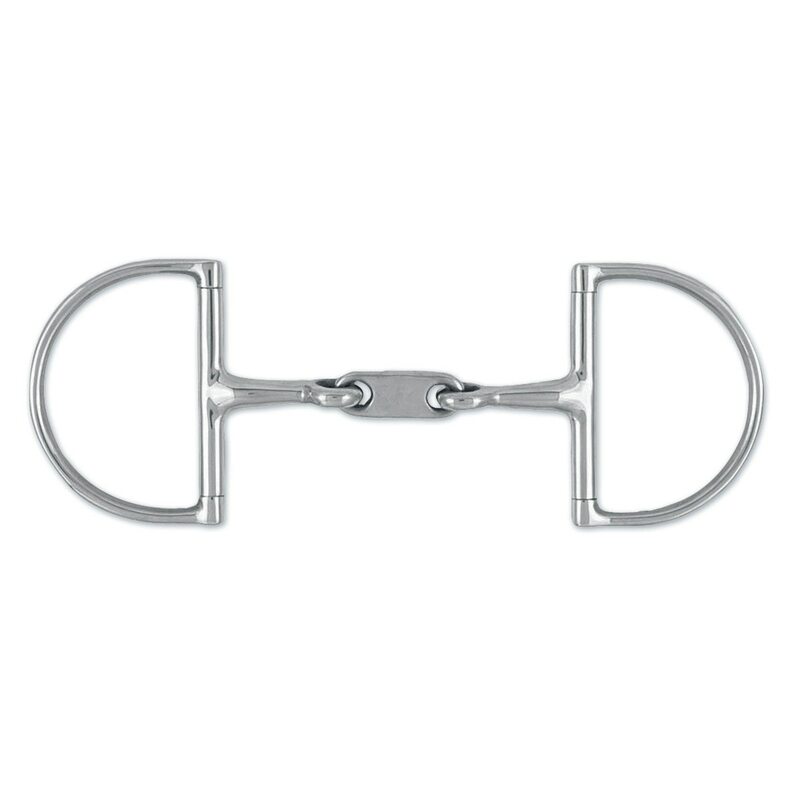 This bit has done a marvelous job and is definitely a step up from a normal snaffle. Rated 4 out of 5 by lefont14 from Nice bit I bought this when I was looking for an alternative bit for my draft cross gelding. He can be pretty downhill and strong in his downward transitions. He liked the Myler Level 1, but I found that he became dull to it after a little while, so I wanted to switch to something else. He hates single-jointed snaffles, so the link in the Dr. Bristol keeps him happy. He listens to my half halts and seems happy in this bit. The only thing I don't love about it is that I've noticed that it does squeak during my ride - it isn't a deal breaker but it is a little annoying. Rated 5 out of 5 by awbostian from Exactly what I expected! I had been using this bit from my trainer & bought one of my own. Works great! Rated 5 out of 5 by Showmyqh from Nice bit Well made. Fits correctly. Looks nice. Works well for my horse that needed a bit slightly stronger than a plain snaffle. My horse seems very comfortable with this bit. Rated 4 out of 5 by patif from Nice bit I purchased this bit to give me more control help with my stubborn "pony"
Rated 4 out of 5 by MWilkie from Nice bit Although the D-rings are quite large, the overall quality of this bit is great! It is slightly curved and the first time using this on my Gelding he readily accepted it and was salivating immediately! I can't say that I have noticed any significant difference in performance from my previous bit, but this is a really nice bit for the price and is working just fine. Rated 5 out of 5 by Allie from Great Bit I upgraded to this bit from a regular hunter dee ring because my Appendix did not respond to seat or half-halts from that bit. With this bit he has steadier movement that stops him from running away with his front, but it helps him to keep his hind engaged and allows his back to round into my hands better, therefore not being too strong a bit where he stays behind the bit, and not too weak where he is constantly above the bit. A great purchase for the two of us! It also stops him from bolting his fences when we jump.